Good grief. 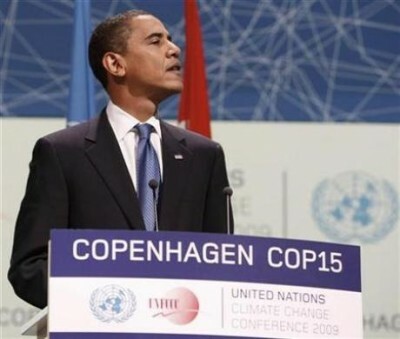 The Obama Administration used their Chicago-style street thug tactics to spy on and threaten countries who opposed the Copenhagen global warming junk science accord. And, here we thought they reserved the use of their Alinsky-style tactics on opponents here at home. Boy, were we wrong. The Obama Administration spied on, threatened and bribed countries to support the Copenhagen Accord. The accord would have devastated American business and manufacturing. Hidden behind the save-the-world rhetoric of the global climate change negotiations lies the mucky realpolitik: money and threats buy political support; spying and cyberwarfare are used to seek out leverage. Negotiating a climate treaty is a high-stakes game, not just because of the danger warming poses to civilisation but also because re-engineering the global economy to a low-carbon model will see the flow of billions of dollars redirected. Seeking negotiating chips, the US state department sent a secret cable on 31 July 2009 seeking human intelligence from UN diplomats across a range of issues, including climate change. The request originated with the CIA. As well as countries’ negotiating positions for Copenhagen, diplomats were asked to provide evidence of UN environmental “treaty circumvention” and deals between nations. The Beijing talks failed to lead to a global deal at Copenhagen. It’s a good thing the US media is ignoring this story. It might reflect poorly on the Obama Administration. They certainly don’t want that to happen.